Genuine OEM Lexmark Toner Cartridge, Yellow, High Capacity 10,000 page yield. Lexmark part number: C748H1YG, C748H2YG. Color Laser Toner Cartridge compatible with Lexmark C748. Remanufactured Lexmark Toner Cartridge, Cyan, 7,000 page yield. Replaces Lexmark part number: C746A1CG. Color Laser Toner Cartridge compatible with Lexmark C746, C748. Remanufactured Lexmark Toner Cartridge, Magenta, 7,000 page yield. Replaces Lexmark part number: C746A1MG. Color Laser Toner Cartridge compatible with Lexmark C746, C748. Remanufactured Lexmark Toner Cartridge, Yellow, 7,000 page yield. Replaces Lexmark part number: C746A1YG. Color Laser Toner Cartridge compatible with Lexmark C746, C748. Remanufactured Lexmark Toner Cartridge, Black, High Capacity 12,000 page yield. 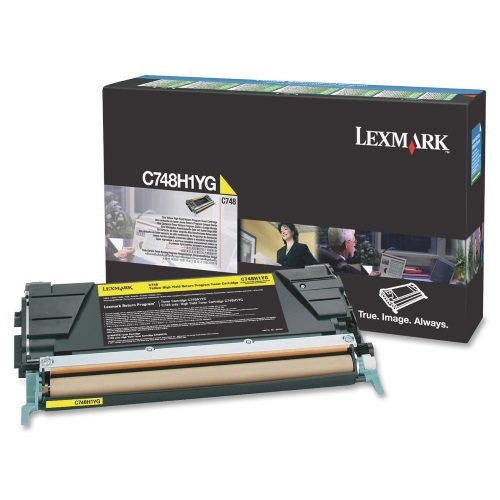 Replaces Lexmark part number: C746H1KG. Laser Toner Cartridge compatible with Lexmark C746, C748.